Except as expressly stated therein, this Site is provided for Your personal noncommercial use only. You agree not to copy or use restaurant development + design's content in any way that infringes on anyone's intellectual property rights. You may not use any name, brand, logo, design, slogan or other designations restaurant development + design uses in connection with its products and services. Any copying, republication or redistribution of restaurant development + design content is expressly prohibited without prior written consent. You are prohibited from using this Site in any malicious or unlawful manner, including but not limited to posting or transmitting any unlawful, threatening, libelous, defamatory, obscene, scandalous, inflammatory, pornographic or profane material or any material that could constitute or encourage unlawful conduct. You will not take any action that imposes an unreasonable or disproportionately large load on restaurant development + design's infrastructure, including but not limited to transmitting spam or using other such unsolicited mass emailing techniques. You agree not to tamper with the software or functionality of the Site and Services and not to introduce any material into the Site or the Services that contains any viruses, time bombs, Trojan horses, worms, cancelbots or other computer programming viruses that may damage, interfere with, intercept or expropriate any system, data or information. Likewise, You must not reverse engineer any of our applications. You are responsible for taking all reasonable precautions necessary to ensure the security and integrity of Your system. restaurant development + design may from time to time monitor or review material transmitted or posted using this Site and reserves the right to delete any material the company deems inappropriate. restaurant development + design is under no obligation to do so and assumes no responsibility or liability arising from any material transmitted or posted using this Site. You may not take any action, or omit to take any reasonable action, which would constitute an invasion of privacy of any other user of the Site or Services in any applicable jurisdiction. You will not misrepresent Yourself or capture data. Use or distribution of tools designed for compromising privacy or security is strictly prohibited. In consideration of Your use of this Site or our Services, You agree to provide accurate, current and complete information as requested on a registration form. restaurant development + design owns the copyrights to all material and the trademarks, service marks, and trade dress (collectively referred to as "Intellectual Property") displayed on and from this Site. Notwithstanding any other term or condition in this agreement, restaurant development + design retains ownership to all Intellectual Property on this Site and all material on and from this Site. Nothing on this Site should be construed as a license to use the Intellectual Property. Your use of the Intellectual Property on this Site is strictly prohibited and nothing contained herein shall be construed as conferring by implication, estoppel or otherwise any license or right under any patent, trademark, copyright or other proprietary right of restaurant development + design. All rights reserved. Your use of this Site and material from this Site is at Your own risk. We use reasonable safeguards to ensure safe, uninterrupted service, but this Site and our Services are provided on an "as is, as available" basis. restaurant development + design makes no warranties or representations that this Site or our Services will be error-free, secure or uninterrupted. restaurant development + design assumes no liability or responsibility for any damage to You, Your computer, or Your other property, due to Your access to, use of, or downloading of this Site, our Services or any materials provided on this Site. As a premier provider of business information for the foodservice industry, restaurant development + design maintains high standards for our editorial content. 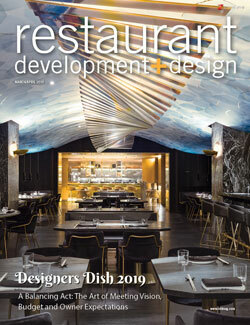 restaurant development + design strives to provide accurate and up-to-date material on this Site. However, restaurant development + design makes no warranties or representations as to the accuracy, completeness or timeliness of the material provided on this Site. restaurant development + design assumes no liability or responsibility for any errors or omissions on this Site. Neither restaurant development + design, any of its agents, nor any other party involved in creating, producing, or delivering this Site is liable for any direct, incidental, consequential, indirect, or punitive damages arising out of Your access to, or use of, this Site or any material from this Site. Without limiting the foregoing, this Site and the material provided on this Site are provided "AS IS" WITHOUT WARRANTY OF ANY KIND EITHER EXPRESSED OR IMPLIED, INCLUDING BUT NOT LIMITED TO, THE IMPLIED WARRANTIES OF MERCHANTABILITY, FITNESS FOR A PARTICULAR PURPOSE, OR NONINFRINGEMENT. Foodservice Equipment & Supplies does not endorse any third party websites not under the control or operation of Foodservice Equipment & Supplies, has not reviewed any or all such sites that may be linked to this Site and is not responsible for any such sites linked to this Site. Your linking to any sites from this Site is at Your own risk. By linking to a site or permitting a link to this Site, restaurant development + design does not endorse the site operator or the content of the linked site. restaurant development + design's Site and Services include advertisements and promotions from third parties. Your business dealings with these third parties are solely between You and the advertiser. Advertising on restaurant development + design's Site and Services does not imply endorsement, and restaurant development + design is not responsible for any loss or damage that may be incurred through Your dealing with these third parties. Your submission of such information shall constitute an assignment to restaurant development + design of all worldwide rights, titles, and interests in the Submissions, including the right to use, reproduce, modify, disclose and distribute the Submissions without limitation. restaurant development + design shall be free to use any ideas, concepts, know-how or techniques contained in the Submissions for any purpose whatsoever, including but not limited to developing, manufacturing and marketing products which incorporate or otherwise rely upon such information, and will not be liable for any use or disclosure of such Submissions. By submitting a Submission, You warrant that restaurant development + design may publish such Submission, use it as part of its operations, and incorporate its concepts in restaurant development + design products without liability or compensation to You. By submitting a Submission, You represent that You have proper authorization for this agreement. Your access may be terminated at any time and for any reason or for no reason by restaurant development + design. You shall have no recourse and restaurant development + design shall have no liability with respect to any such termination. All provisions of these Terms and Conditions relating to warranties, confidentiality obligations, proprietary rights, limitation of liability and indemnification obligations shall survive the termination or expiration hereof. restaurant development + design may modify these Terms and Conditions at any time. The amended terms will be effective upon posting on the Site. Your continued use of the Site and/or the Services constitutes Your assent to such amended terms and Your agreement to be bound thereby. restaurant development + design may, but is under no obligation to, provide You notice of such modifications to these Terms and Conditions via email or other communication.